So I’ve recorded another cover of video game music. This time, I’m playing a metal version of the Final Fantasy theme song (sometimes called “Final Fantasy Prologue”). This song is pretty straightforward, though I did try to throw in some jazz. The solo’s chord progression that starts at 2:24 I model off of Miles Davis’s “So What”, which modulates between D dorian and Eb dorian. My version modulates between C dorian and Db dorian. Yay metalized jazz! Though the solo itself isn’t jazz. 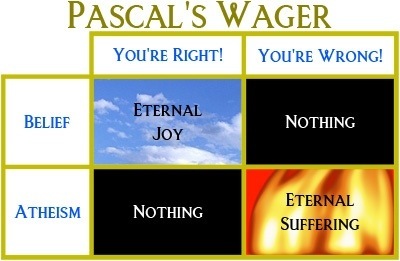 Pascal’s Wager is a pretty infamous case of religious logic. The Wager goes, given the choice between believing in god or not believing in god, there are four possible outcomes. If you believe in god, then if god exists then you go to heaven. If you believe in god and god doesn’t exist, then nothing happens. On the other hand, if you don’t believe in god, and god exists, then you go to hell. If you don’t believe in god and god doesn’t exist, then nothing happens. Pascal argued that eternity in heaven is a much better option than an eternity in hell, so it would be rational to believe in god, just in case. What’s the harm, even if god doesn’t exist? From a decision theory perspective, Pascal is succumbing to unbounded utility; that is in this case, a utility function that allows for infinities. Since 0 and 1 are not probabilities, it follows that anything multiplied by infinity is also infinity. Meaning, even if you assign a 0.000000000000000000000000000000000000000001% chance of god existing, adding an infinite utility in going to heaven creates a situation where you gain infinite utility with believing in god and infinite negative utility in not believing in god. This might seem like a win for a theist who subscribes to Pascal’s Wager and/or infinite utility, but it also introduces some other wacky “rational” behavior. Let’s say you are walking down a dark alley. A dark figure approaches you from the shadows, demanding money. There’s no weapon visible on the person, and he doesn’t actually seem very threatening. He asks you about Pascal’s Wager, and hypothetically you think it’s a rational decision to believe in god, given the infinite utility it rewards you with. The shady person then claims that he’s not actually from this world, but the world above; he claims that your reality is really a simulation and he’s one of the programmers. He then says that if you don’t give him 10 dollars, he will use his programming powers to generate 3^^^^3* people and torture them for eternity, in your simulated reality. Is $10 really worth the lives of 3^^^^3 people being tortured for eternity? If you accept the unbounded utility function of Pascal’s Wager, then you must also accept a similarly unbounded utility function here; $10 certainly isn’t worth 3^^^^3 lives given the off chance that this mugger is telling the truth. Meaning, 99.99999999999999999999999% * 10 is never going to overcome 0.0000000000000000000000001% * 3^^^^3. This hypothetical decision theory scenario is called Pascal’s Mugging, a sort of reductio ad absurdum critique of Pascal’s Wager. Well, maybe now we know why religiosity is correlated, the world over, with high income inequality. But it goes deeper than that. As I mention in my post the thief and the wizard, there are two general modes of thought that our brains have. System 1 (the thief) and System 2 (the wizard). System 1 is fast, generally thought of as “intuition”, and System 2 is slower, generally though of as “rationality”. I picked “thief” and “wizard” because anthropomorphizing those two systems helps people remember them and their intuitive (heh) qualities. We default to System 1 for the vast majority of our daily tasks, and if we’re tired or stressed out we rely even more on System 1 thought processes in situations where we would be more likely to use System 2. So, for example, Ara Norenzayan has shown that subtly reminding people of death makes them say they are more religious. That’s probably related to something called ‘World View Defence’ – when you remind people about death, they tend to grab onto their traditional, cultural values. Similarly, Iranian students who are made to feel more anxious are more likely to support suicide bombers. The effect can be quite specific. Aaron Kay has shown that making people feel like they are not in control strengthens their belief in a controlling god – in other words, they compensate for lack of control in their own lives by believing in a god that has it all in hand. What’s more, Kurt Gray has shown that people invoke god as a moral agent to explain negative (but acausal) events. Our thoughts about the world are subject to all kinds of unconscious biases, and it’s widely believed that these contribute to religious beliefs. And some of these biases are strengthened when people are made to feel anxious. For example, Nicholas Epley has shown that making people feel lonely increases their belief in the supernatural – and also makes them more likely to think that household gadgets have personalities! In another study, Jennifer Whitson and Adam Galinsky have shown that manipulating people so that they feel out of control makes them more inclined to see patterns that aren’t really there. This is a key part of superstition – once you start to believe that a rain dance actually does make rain, it’s a short step to invoking a deity to explain the link. Anxiety = higher cognitive load. Higher cognitive load = less System 2 and more System 1 reasoning. More System 1 reasoning = more god belief, among other things. Jetlagged (i.e. anxious and tired) and traveling to a sacred place will have all sorts of (now predictable?) odd behavior. Hell, it even happens in dating. Lowering someone’s self-esteem and/or making them anxious makes them default to System 1. And feeling something is scarce will also default you to System 1 thought processes (also in that post is System 1 — i.e. groupthink — asking System 2 to come to its defense). What else do people do when they’re stressed out? They eat lots of comfort foods, like ice cream or cheesecake. So this was an interesting post about the role of music in human evolution. The general gist of music is that it is more “primitive” than actual speaking. The book that’s being reviewed, Joseph Jordania’s Why Do People Sing? : Music in Human Evolution, is admittedly only theoretical, but it’s still pretty interesting nonetheless. When our ancestors first moved from the forest to the savannah, we were not yet capable of making tools. But early hominid evolution tended away from a physiology that would have helped us hunt and/or defend ourselves from predators. Our canine teeth receded, we became slower and weaker, and we didn’t develop tough skin (in fact the opposite). Lion evolution and migration seems to have mirrored early hominid patterns, both spatiotemporally and (in some ways) behaviorally and morphologically. Lions, for example, are the only social species of cat. 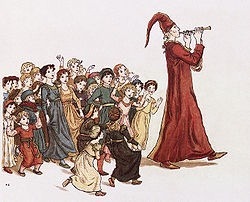 Of all singing creatures, humans are the only ones who use rhythm. Rhythmic chanting and dancing induce trance states. My suggestion is that our ancestors turned loud singing into a central element of their defence system against predators. They started using loud, rhythmic singing and shouting accompanied by vigorous, threatening body movements and object throwing to defend themselves from predators. As I’ve pointed out many times, our brains are optimized for social activity and not intellectual activity. Meaning that things that promote group bonding will be things that feel good, such as singing together, dancing together, supporting your group’s arguments, and so forth; all of these things promote empathy. And empathy is a leading indicator in god-belief. This might explain why that all came about in the first place. I mean, if you think about it, singing together in harmony seems pretty arbitrary. Why would your brain release Oxycontin when you dance in harmony with a group? Defense from predators seems like one likely explanation. And in that ancient context, isolation was pretty deadly. In the modern world, loneliness is actually physically unhealthy, which probably prompts us to seek out groups which have human-designed methods for increasing group bonding, like church or god.